It's been too long friends! I feel like the holiday season hit like a hurricane, and now I'm left dazed and confused, spun dizzy, drenched, and picking the leaves out of my hair. But alas! It's a whole new year! At the first 2014 meeting of the MadModQuiltGuild this week, a fellow member introduced us all to an ongoing phenomenon known as "Project Quilting". Apparently this is a wonderful challenge set forth by Kim at Persimon Dreams. The 5th season of said challenge kicked off this week, and I'm just barely squeaking in my entry at almost the last second. Click here to go to the Project Quilting Challenge page. This challenge revolves around strings. To enter, a string quilt must be produced (start to finish) within this week of the challenge and submitted by noon today. Eek! I better get typing. So here she is, henceforth and forever more called: Rainbow Runner. Finished size: 59" x 11.5"
All of the colors in this project came from my scrap bin, and all are strings measuring 2.5" wide or less. I foundation pieced them onto 8.5" muslin squares. I had just purchased some Robert Kaufman Essex Linen this week, so I thought that would be great to use since I love the stuff. The sashing/border is all from 2" (1.5" finished) strings. The binding is a straight-grain 2.5" double-fold, and hand-stitched to the back. The backing is also made with the Essex Linen. I'm slightly embarrassed to admit that this was the first time I've free-motion-quilted with my Juki 2010Q. The process just reinforced how much I LOVE HER! Not a single thread break. Did you really start this after our Thursday meeting? You rock! It's awesome. This is fantastic! I love hearing you call PQ a 'phenomenon' too - made me smile! I can't wait to see what you come up with for the challenge. 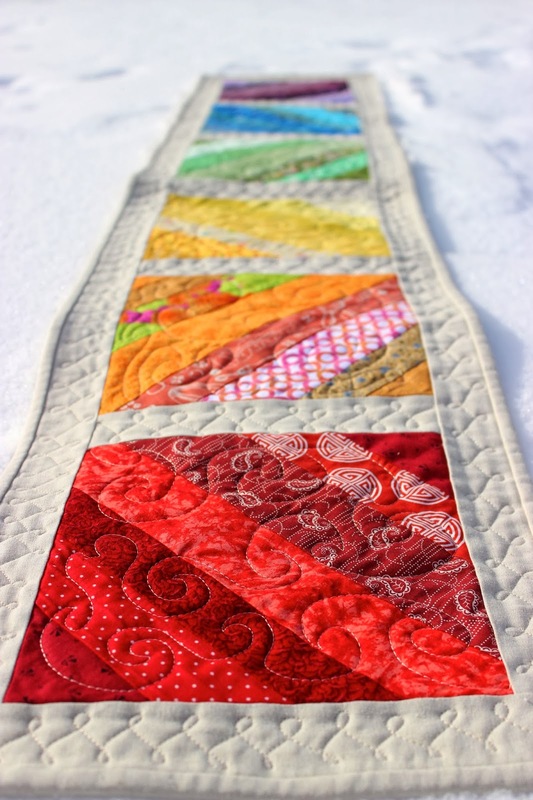 Your quilt is great and your FMQ is fabulous!